November | 2009 | "é rayhahn, rayhahn"
Toad the Wet Sprocket is one of those groups I never appreciated at the time but enjoy now. And Vitamin Z was a great 80’s pop group that never quite got off the ground. I’m really surprised this card is an update; didn’t Topps have enough cards in their base set to include the backup catcher, particularly one who’s a veteran and been on the team for several years? I guess not. Anyway, this was a lot of fun, Thorzul, and I’ll look forward to it the next time it comes around. Best of luck in your collecting! Monday’s mail brought a package from Night Owl over at Night Owl Cards, the latest trade over the web – this time Twins for mostly 1971 cards from my childhood. Night Owl whacked a few cards from my wantlist, plus a few that hadn’t made it onto the list yet. 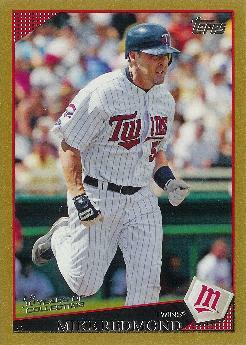 It turns out that there is a Toppstown Blue parallel, too. Night Owl has a whole lot going on at his website — check it out, and make a trade with him, while you’re at it. He has the Runner Seal of Approval (whatever that is). Thanks again, N.O. re: #2 – I was at the Wiltern Theater in L.A. when this concert was recorded on July 19, 1986. Most memorable part was the series of acoustic solos and duets performed by Steve Hackett and Steve Howe to open the concert. I went out to get the mail the other day, and noticed the Carolina Mantis at the side of our front step, so I nabbed the camera and got a few pics. When I finally dumped them to the computer and checked them out, I noticed she was laying an ootheca! Now I feel like a heel for disturbing her work. I’ll have to be on alert next spring for when the young ‘uns start appearing. Mo and I were by the breakfast nook yesterday afternoon, and I was annoyed to see a green lacewing laying eggs on the sliding glass door. On closer observation (with my myopic, non-bifocalled eyes), I noticed the “raptorial” front legs, and ran to grab my camera. Trading with Jim gets two thumbs up from me; I’m sure we’ll work out another swap sometime. And for him (and all of us), I’d sure love for the Phillies to take things in hand in the World Series, too.